Researchers at the MRC Laboratory of Molecular Biology at Cambridge University have grown a miniature brain in the lab which created functional tendril-like connections to spinal cord and muscle tissue. The muscle tissue was observed to contract as a result of signals sent from the brain organoid. The brain organoid is a cluster of cells just a half a millimeter across and was grown from human stem cells. This was not the first time that a brain organoid has been grown by the researchers, but the latest experiments have achieved a much more sophisticated stage of development that closely resembles the brain of a human fetus at around 12-16 weeks of pregnancy, in terms of the variety of neurons and their organization. The brain organoid has approximately 2 million neurons, which is just a fraction of the 80-90 billion neurons in an adult brain but does represent a significant step forward. Previous attempts to grow brain organoids in the lab have failed after the tissue reaches a certain size as the supply of nutrients to the center of the cluster of neuronal cells becomes more difficult. Once the cells reach a certain size, due to a lack of oxygen and nutrients the neuronal cells in the center of the cell cluster start to die and development stops. The researchers overcame past problems by developing a new technique, which involves cutting the organoid into slices half a millimeter thick and floating them in a nutrient-rich liquid. That ensures the tissue receives sufficient oxygen and nutrients and can survive for longer. 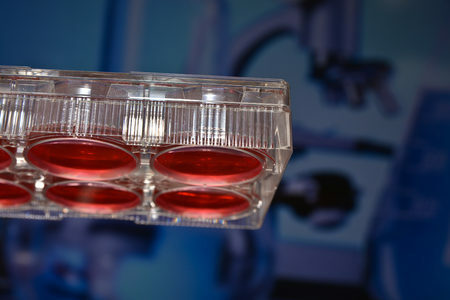 The researchers were able to keep the tissue alive in culture for more than 12 months. The researchers placed a 1mm section of mouse spinal cord tissue with associated back muscle tissue next to the brain organoids and observed the cells sending out neuronal connections to the tissue. Electrical impulses then started to be sent which caused the muscle to twitch. The development of functional nerve tracts growing out of brain tissue in the lab, and then innervating with other tissues is a major step forward. “These cultures exhibit active neuronal networks, and subcortical projecting tracts can innervate mouse spinal cord explants and evoke contractions of adjacent muscle in a manner dependent on intact organoid-derived innervating tracts,” wrote the researchers. The aim of the research is not to recreate a brain in the lab per se, but to develop a brain organoid which can be used to study brain and nervous system development. It is hoped that organoids can be grown to model diseases to better understand their effect on the brain and nervous system, which ultimately could lead to new treatments for illnesses such as epilepsy, schizophrenia, and motor neurone disease.